Here is a quick overview of our brands. AEI Corporation products are of excellent quality built using superior materials. A grill, heater or fire feature is an attractive addition to any restaurant, home patio or resort. Well-known for being a leader in the grills industry, PGS is a brand of AEI Corporation and features a vast collection of outdoor (natural) gas and (liquid) propane grills. Boasting the Legacy series, PGS has established itself as a go-to source for all of your outdoor space patio grill needs. PGS grills are great for any residential setting and thanks to their portability; they are easy to move from one space to another, allowing you to conveniently grill from anywhere on your property. If you're looking for an all aluminum grill, make sure to check out PGS A-Series (line of) grills featuring all-aluminum materials, which are built to last in harsh weather environments. 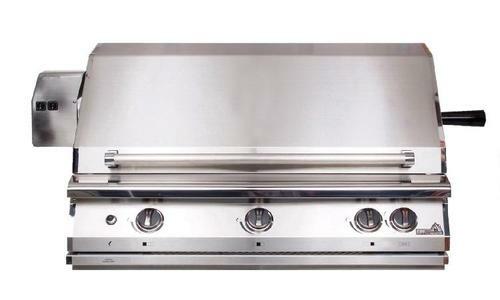 PGS T-Series line of grills is specifically designed to be used on commercial properties, including apartments and condos. Equipped with an automatic grill timer PGS FuelStop®, the T-Series grills optimize safety by automatically shutting themselves off after 60 minutes of use. This is a very notable feature for property managers who are always on the lookout for ways to enhance the safety of grill use on commercial properties. Sunglo heaters are available in both natural gas and propane and serve as very decorative accessories for your outdoor areas. Sunglo has been establishing itself as a brand leader in the outdoor heating industry since 1961 and specializes in circular radiant heaters. These heaters are ideal for both residential and commercial settings, including restaurants, hotels, and private outdoor dining areas, such as your back patio. One of the most notable aspects of Sunglo heaters is that they are available in freestanding versions as well as ones that can be hung above tables. If you're looking for a heater for an open area, the PSA265 Sunglo model makes for a great choice and even comes in three ignition options -- manual, semi-automatic, or fully automatic. The A242 model is one of Sunglo's best portable heaters, while the A244 model is the go-to choice for those looking for a suspended heating option. If you're looking for an exceptionally easy-to-port heater, the A270 model is an excellent choice. When it comes to optimal patio comfort, you can't go wrong with AEI's Patio Comfort line of outdoor heaters, all of which have been designed to provide safe heating in the most efficient manner possible. Not only do these heaters add warmth to outdoor spaces but they do so in a safe manner. More so, they can serve as decorative accessories, adding both ambiance light and heat to patio areas. Patio Comfort heaters are available in both natural gas and propane options, which maximizes your outdoor heating solutions regardless of the places you want to use them. Whether you want to use them on a commercial property or the patio of your own home, these safe heaters are available in a broad range of colors, sizes, and mounting options, all of which deliver draft-free infrared radiant heat that feels like you're being toasted by the sun. Ambiance, a leader in the outdoor patio industry, provides portable fire features that serve as decorative accessories. Featuring a ceramic burner and borosilicate glass tube, these fire features are resistant to both structural damage and discoloration. Thanks to various flame options, you can easily control the visual aspects of the dancing flame, which is perfect for mesmerizing your guests during an outdoor patio party. You can't go wrong with Infratech electric patio heaters. Adding warmth to just about any location, including enclosed spaces and outdoor patios, these UL Listed heaters are 93 percent energy efficient and are able to turn over huge savings on your heating bill when it comes to heating outdoor and enclose areas. Even better is that they make for an excellent way to go green because they are made entirely out of recyclable materials (They are not made of recyclable material. The materials can easily be recyclable). To top it off, they produce zero greenhouse emissions. And did you know that infrared heat doesn't actually heat air? It heats the objects in which the heat comes into contact with, making it an incredibly safe option for heating patio and outdoor spaces. And because they are designed with low clearance, they provide an immaculate appearance and don't create a huge visual impact; this is especially advantageous for courtyard parties and any outdoor event. When in need of a wall- or ceiling-mounted heater, Sunpak heaters serve as a perfect solution. These heaters are designed for patio areas and come with an easy-to-install mounting kit. Since they use infrared heat, they can heat outdoor areas very efficiently. They also come programmable through a duplex switch, meaning there is no need to control them with remote control. The duplex switch can be used to control a Sunpak heater at either 25,000 or 34,000 BTUs of heat on our two-stage model versions.